Emart is one of the three largest chains of hypermarkets in Korea. The other two being Lotte Mart and Homeplus. It is my husband’s favorite place to shop for groceries and other basic needs. I prefer Homeplus for their lower prices and Lotte Mart for its proximity to our place. On my second day in Korea, my husband and I visited the Emart branch in Seongsu-dong. I would say it is the first place (aside from the airport and the apartment) that I went to in Korea. So who would forget it, right? 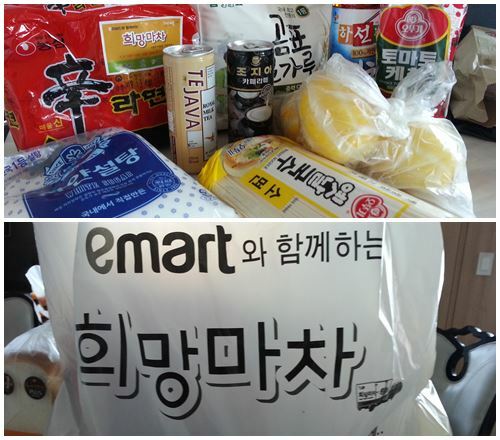 Last July 24, Emart sponsored a í¬ë§ë§ˆì°¨ or “Hope Wagon” in Kyunghee University for the benefit of multicultural families. I didn’t have an idea at first what it was. My son’s teacher just added me to the list of “beneficiaries” and I just went there out of curiosity. It turned out that the “Hope Wagon” is a charity run by the company. At the venue, a shelf with grocery products was set up while the staff assisted the beneficiaries. I was given a basket and told to choose the products that interested me. I chose a few basic goods that we didn’t have. The staff wrote down the products I chose and she put them in the bag, too. This isn’t the first time that we received food items. A few years ago, a man and his daughter working for the “Food Bank” visited us with groceries as well. We were thankful but it was an awkward moment for us. I ended up giving away much of what they brought like the red pepper paste and the sack of rice. My mother-in-law supplies us with her own red pepper paste, soybean paste and soy sauce. My parents-in-law also give us three sacks of rice every year and that’s more than enough for our family of three. I like the “feeling” of receiving items, but getting food items somehow make me feel guilty. And that’s because I know that there are people out there who might need them more. Koreans are generally generous but they should stop thinking that all multicultural families need help. I would feel awkward too, but maybe they are just trying to make the multicultural families feel welcome as opposed to thinking they need help? What do you think? That is funny and weird ) i never heard about it before. Is it same with all multicultural families? i want to visit Korea, really explore various places , i love to travel !